Newly decorated 2 bedroom Greenslakes Cottage is a perfect Kiawah Island retreat offering views of the 1st hole of Cougar Point Golf Course, screened in porch facing golf course it is ideal for al fresco meals or just relaxing. Community pool available for guest use at no charge. 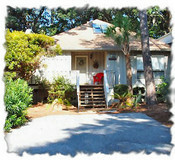 Coming to Kiawah with friends and want to stay close by? - the cottage next door is available. This vacation rental has been viewed 5,563 times since 02/22/2011. Each property is independently owned and operated. All listing information has been furnished by the property owner/manager. Please read our disclaimer.